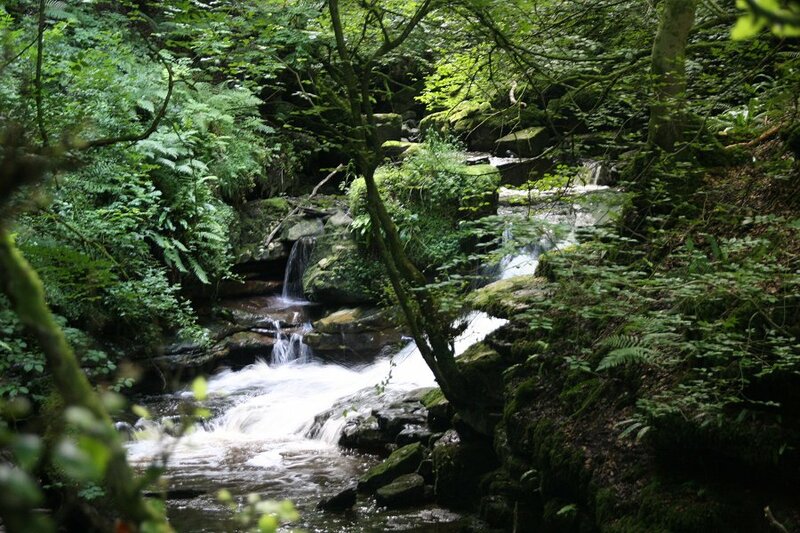 The southeast end of the Brecon Beacons is my home turf, whether over or under ground. 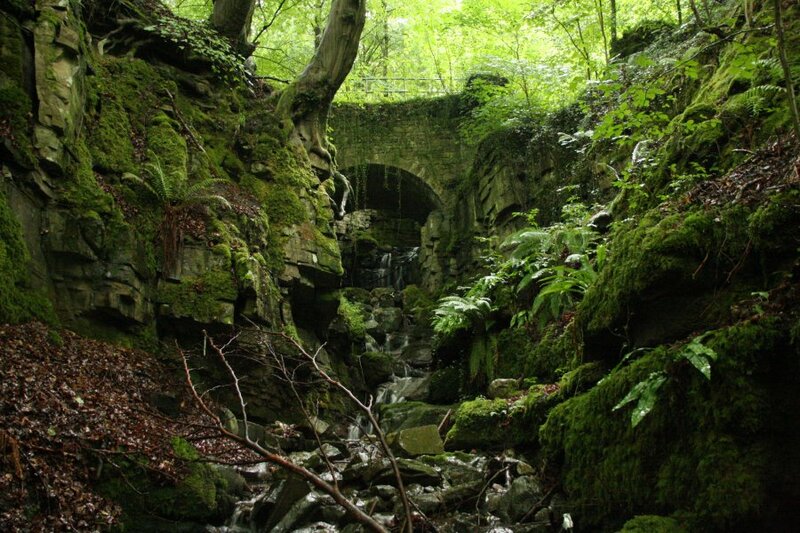 The mountains may actually be just hills, but they have great views, with wild nature and waterfalls hidden among the industrial past and urban present. Inversion at Pwll Du. The black hill is a coal tip, and the mountain in the background is the Blorenge (561 metres). 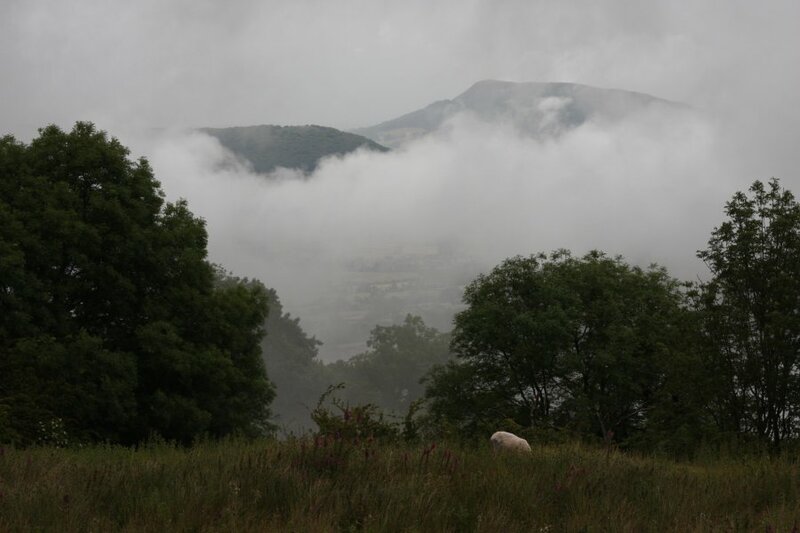 Inversion with the Skirrid (486 metres). Clouds nearly lifted. Pen Allt-mawr (719 metres) and Pen Cerrig-calch (701 metres). The Blorenge ridge with the summit on the left, the Nant Llanelen valley in the middle, and the Mynydd y Garn-fawr ridge on the right. The flat lands of Monmouthshire extend into the distance, with only Edmund's Tump (423 metres) appearing as a hill on the left. In the distance is Raglan (the road can just be seen heading towards it) and tucked just out of sight on the right is Usk. 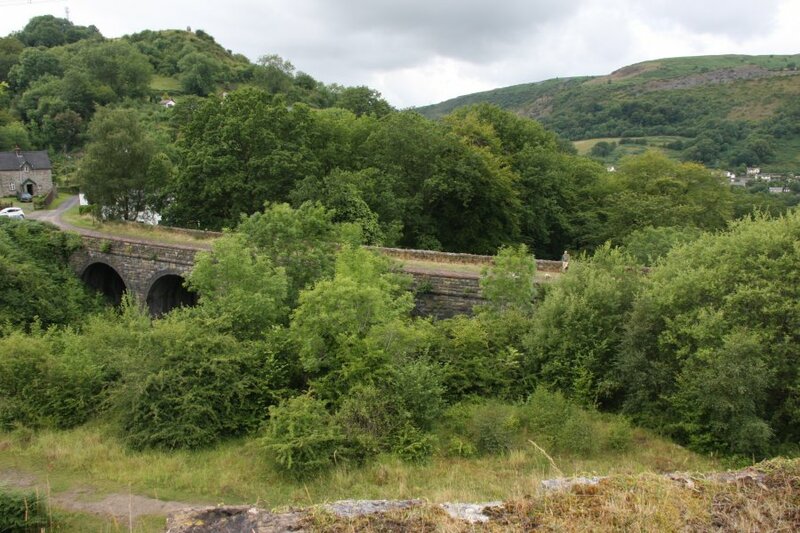 Our route starts towards Blaenavon, over the Mynydd y Garn-fawr ridge. 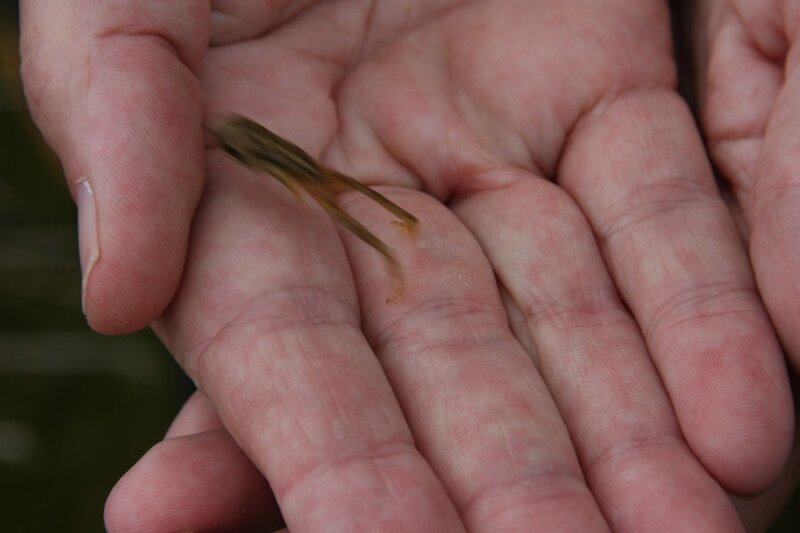 Absolutely tiny, probably only recently turned from a tadpole. We were aiming for a quarry where we were hoping some lizards might be found, but we saw none. 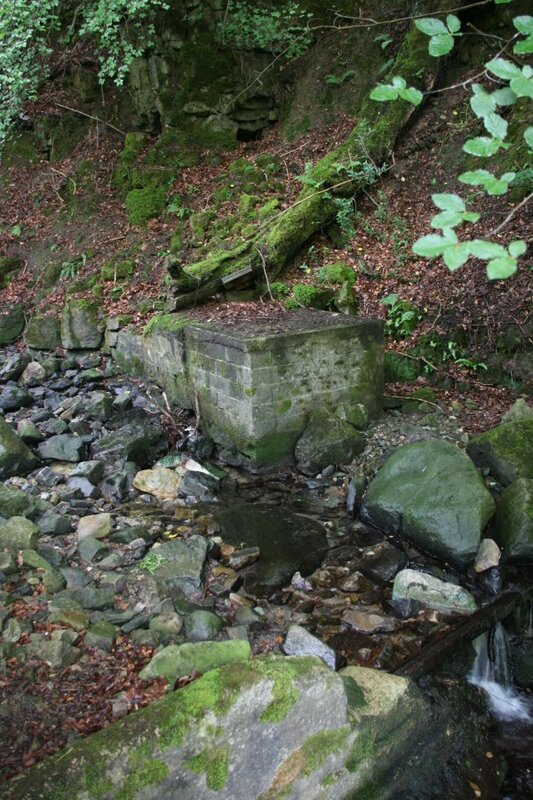 This part appears to be an industrial revolution era iron ore scour rather than a quarry. 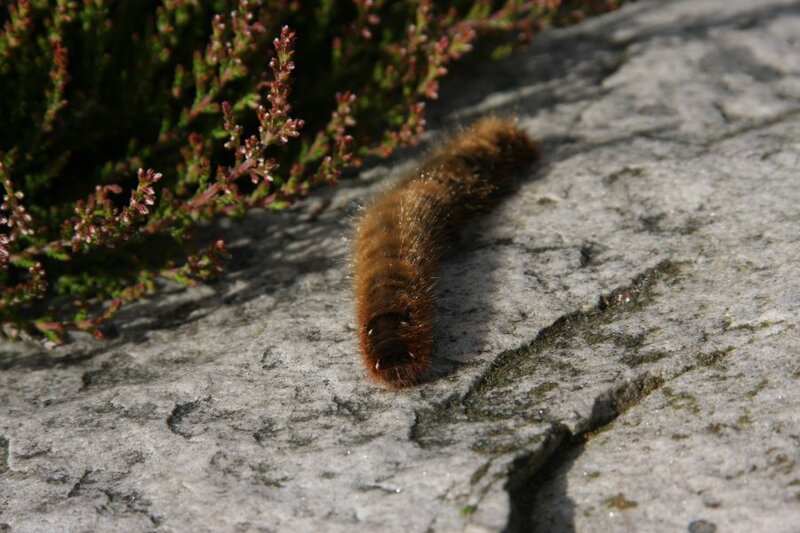 Oak eggar caterpillar. 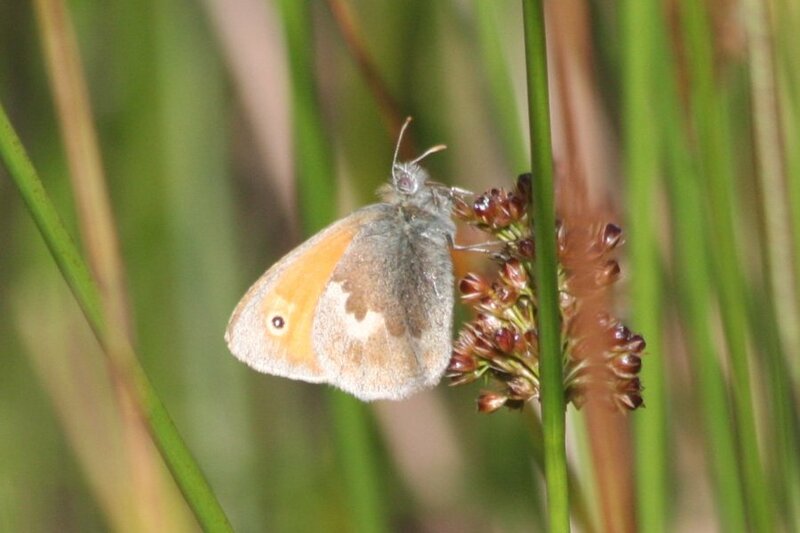 Despite the name, they do eat heather as well as oak trees, which is fortunate, since there are no trees whatsoever up here. 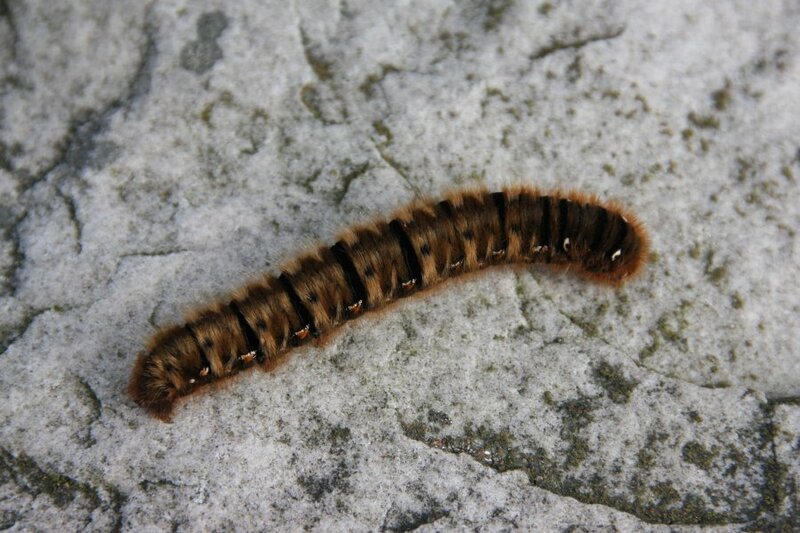 Oak eggar, with its brown hairs, black spots, black rings, and white side patches. 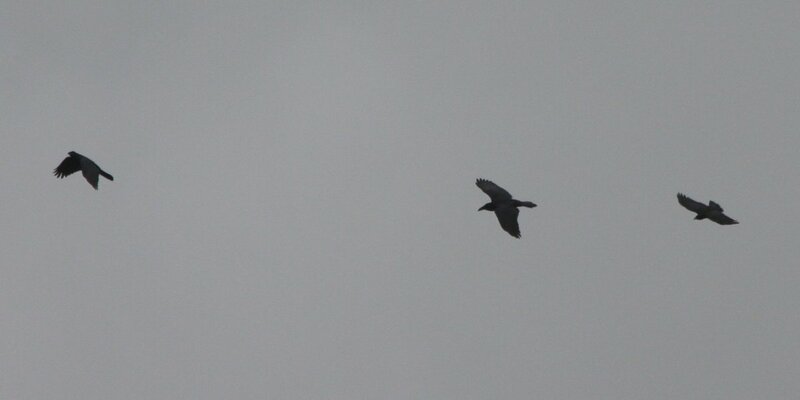 This one seems to have red patches as well. 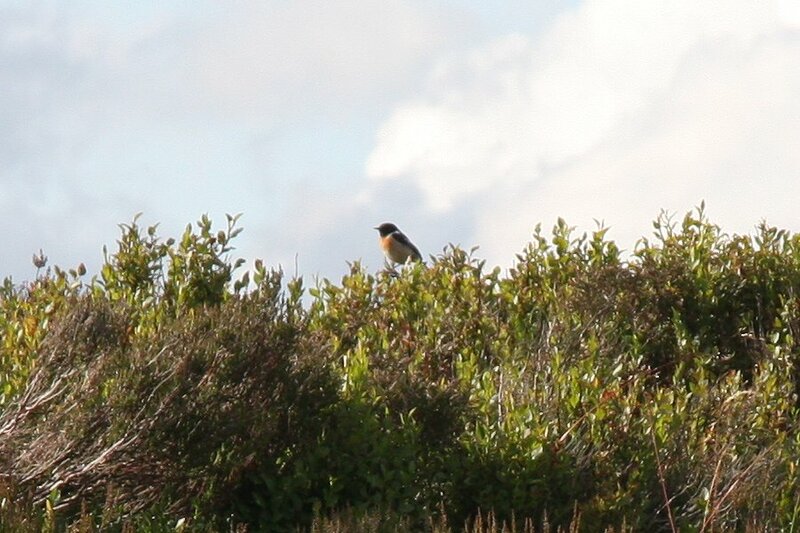 Male stonechat on the bilberry/whimberry bushes. Slow worm hiding among the roots. 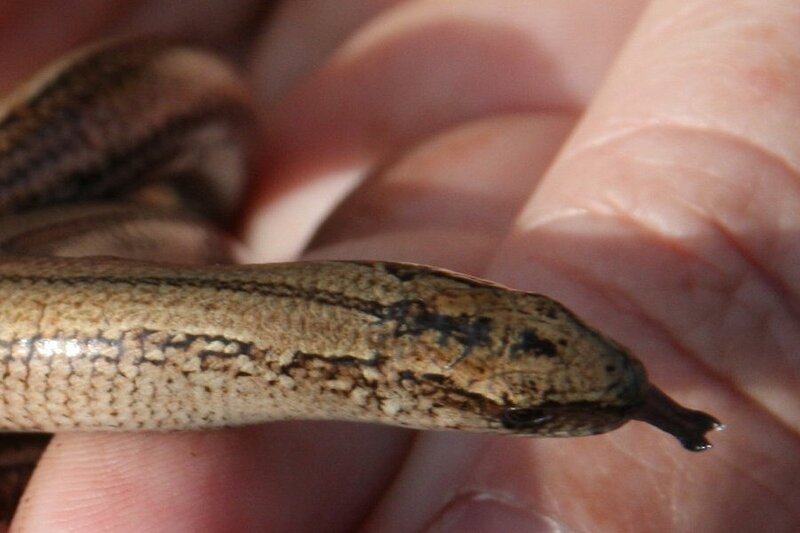 These legless lizards (not snakes) can be handled with great care, but if frightened will drop off their tail - it never grows back. 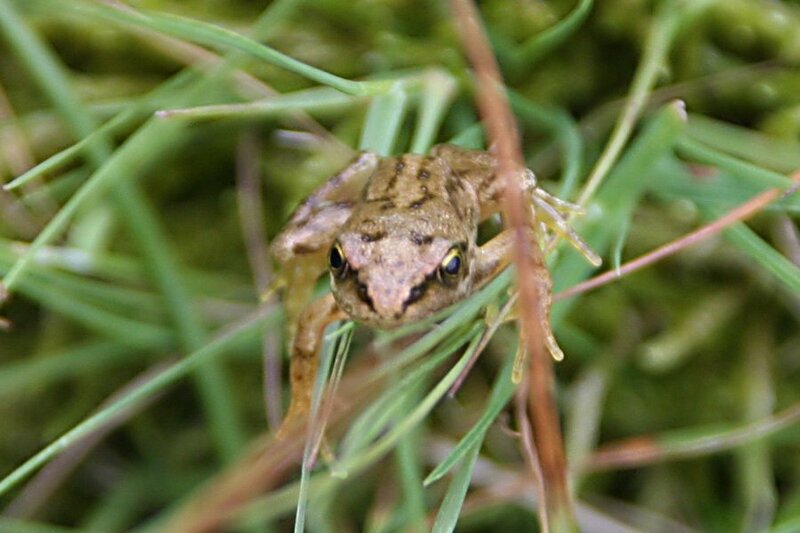 All other British lizards are lacertids - closely related to skinks. 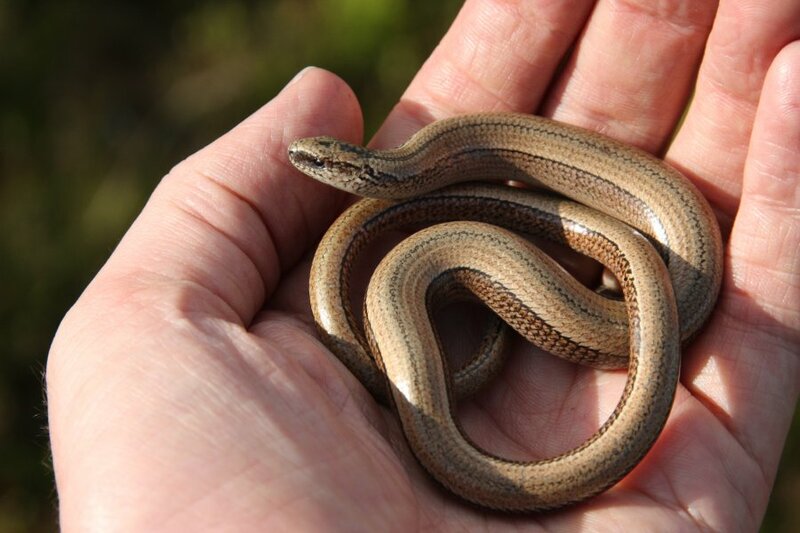 The slow worm is the only British Anguid. 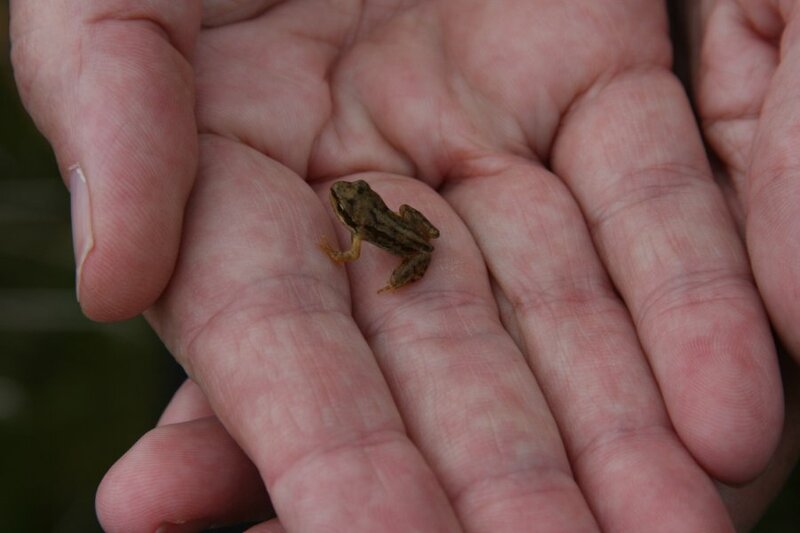 All British reptiles are legally protected; my walking companion monitors the reptiles in this area as part of a national programme. 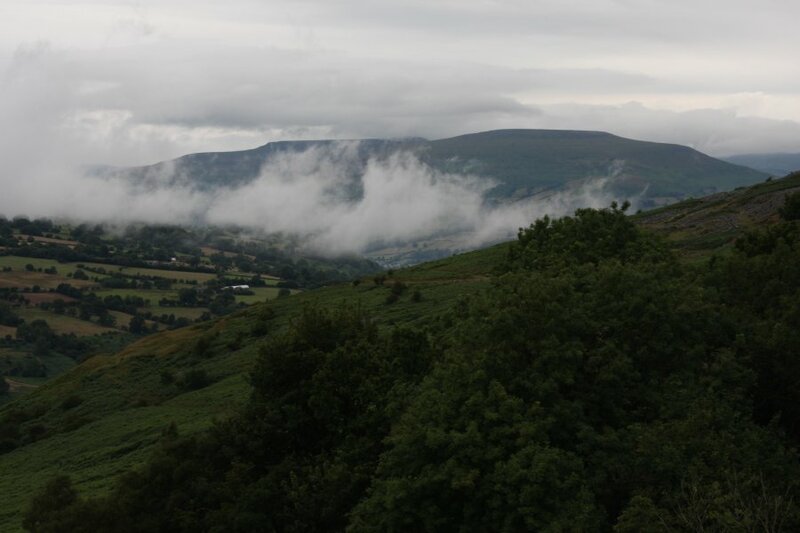 Panorama of the Black Mountains from Pen-fordd-goch, the top of the Tumble valley. In the distant left are Corn Du (873 metres), Pen y Fan (886 metres) and Waun Rydd (769 metres) in the Central Beacons. Closer to the camera is Mynydd Llangatwg (530 metres), followed by Gilwern Hill (441 metres), the Pwll Du saddle, and lastly the Blorenge on the right. In the Black Mountains are Mynydd Llangorse (515 metres), Mynydd Troed (609 metres), Pen Allt-mawr, Pen Cerrig-calch, Waun Fach (811 metres), Pen y Gadair Fawr (800 metres), Pen Twyn Mawr (658 metres), Chwarel y Fan (679 metres) in the background, Crug Mawr (550 metres), the Sugar Loaf's obvious pointed top (596 metres), and Hatterrall Hill (531 metres). 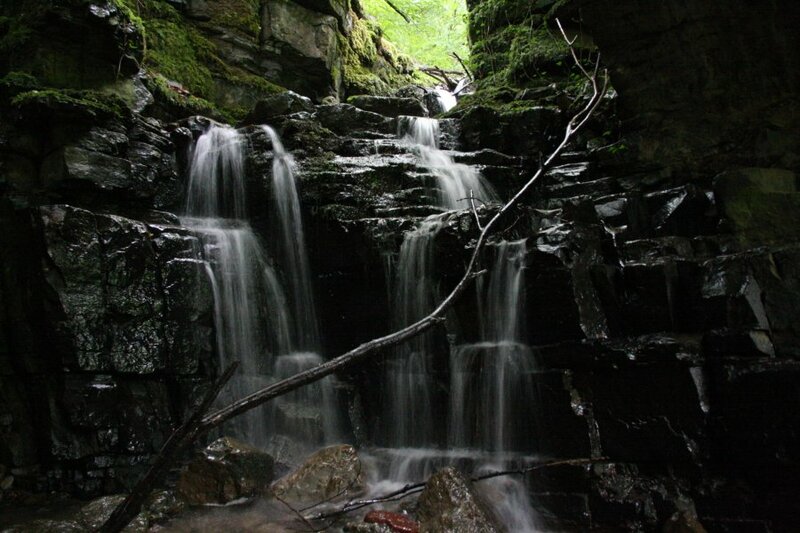 Button's Waterfall, at the top of Cwm Dyar, between Llanelly Hill and Gilwern Hill. 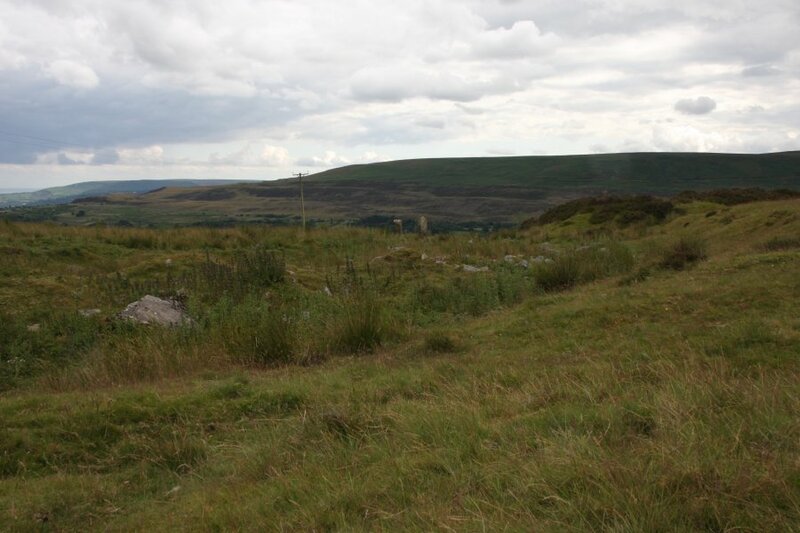 Llanelly Hill is a ridge rather than a hill, leading all the way up to the Blorenge. 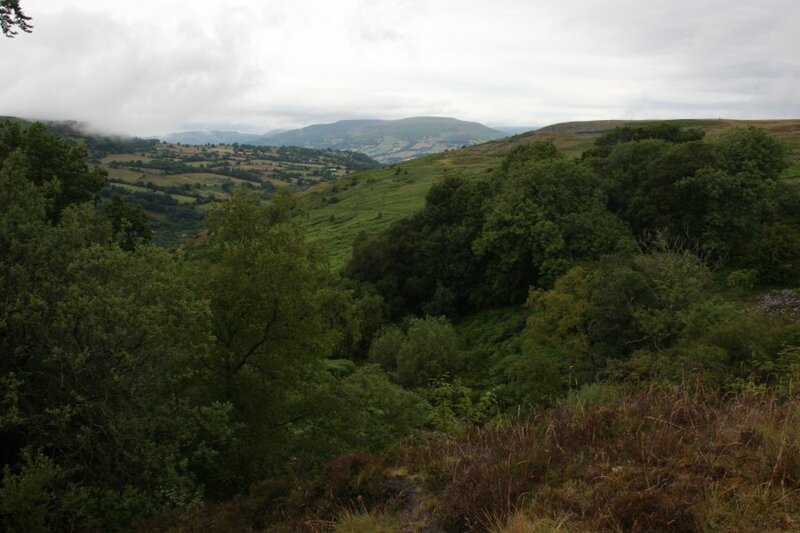 The highest point lies near the Blorenge's main ridge at just over 530 metres, topped by coal tips. 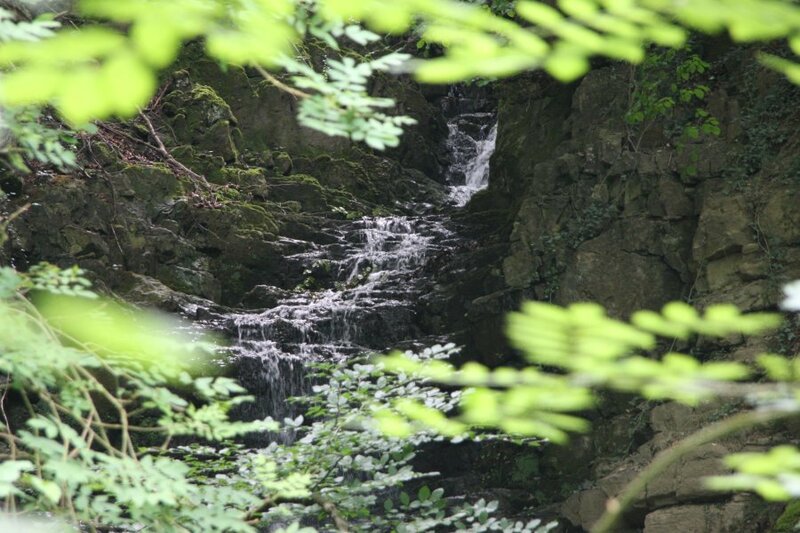 Looking down the waterfall towards Gilwern Hill. Looking down Cwm Dyar. In the distance are Mynydd Llangorse, Mynydd Troed, Pen Allt-mawr and Pen Cerrig-calch. 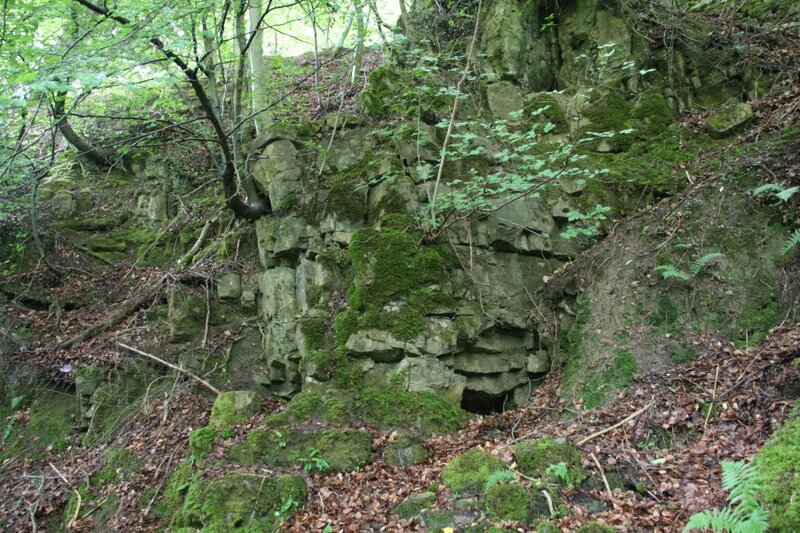 Remains of an enclosure where water was taken from the Domis Natrix cave, half way down Cwm Dyar. 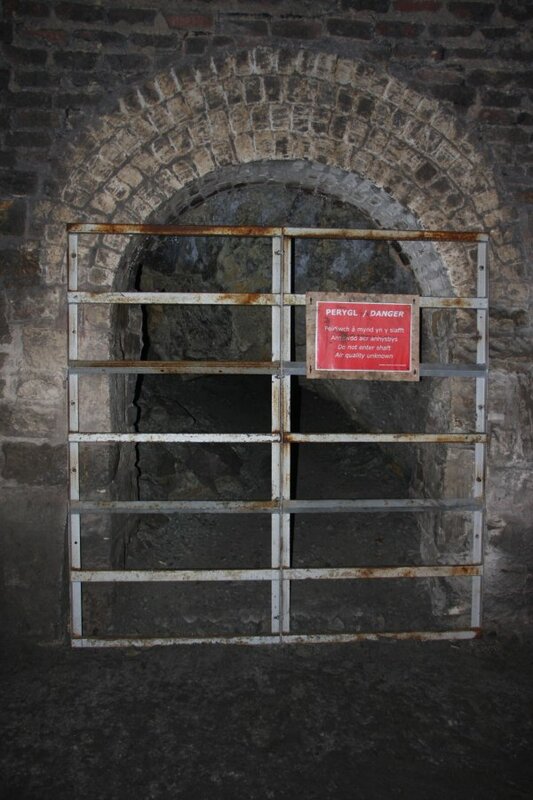 The cave's resurgence in the enclosure. Entrance to Domis Natrix above the enclosure. 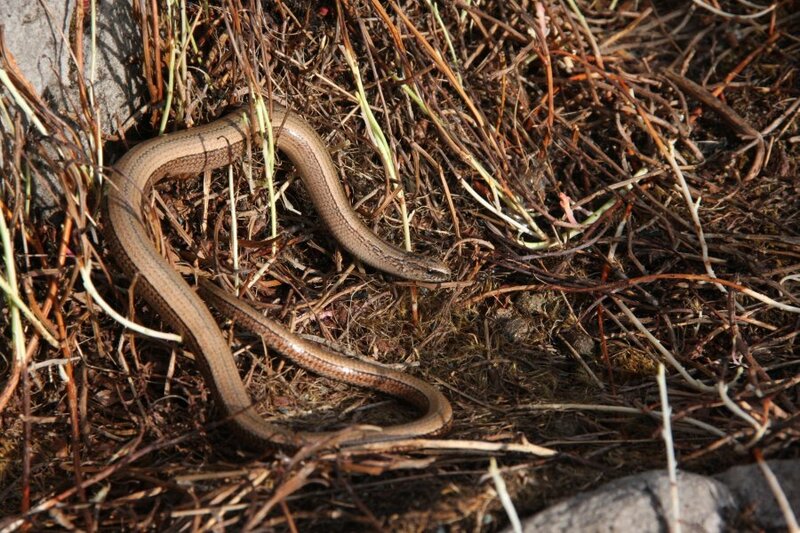 The name translates to "House of the Grass Snake", as well as being an obvious double entendre. 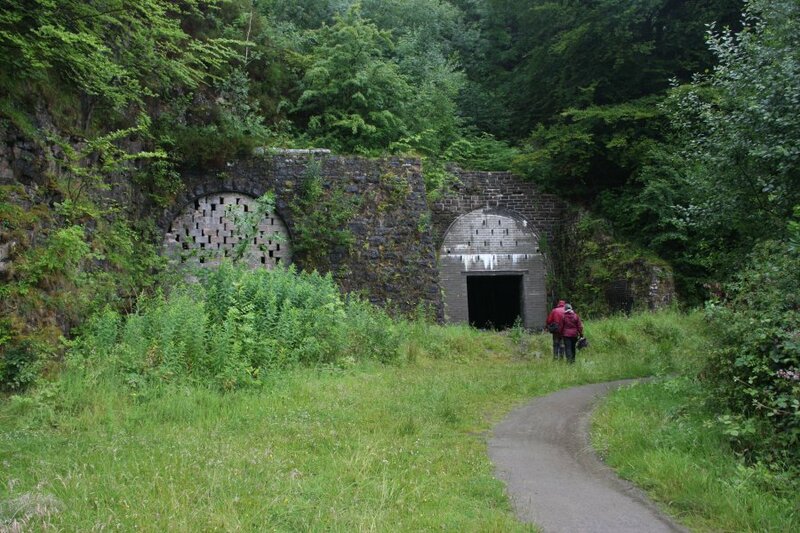 Brick-lined resurgence below the Gilwern Hill quarries, known as Clydach South Resurgences No 1 in Tony Oldham's books about the caves of Clydach. 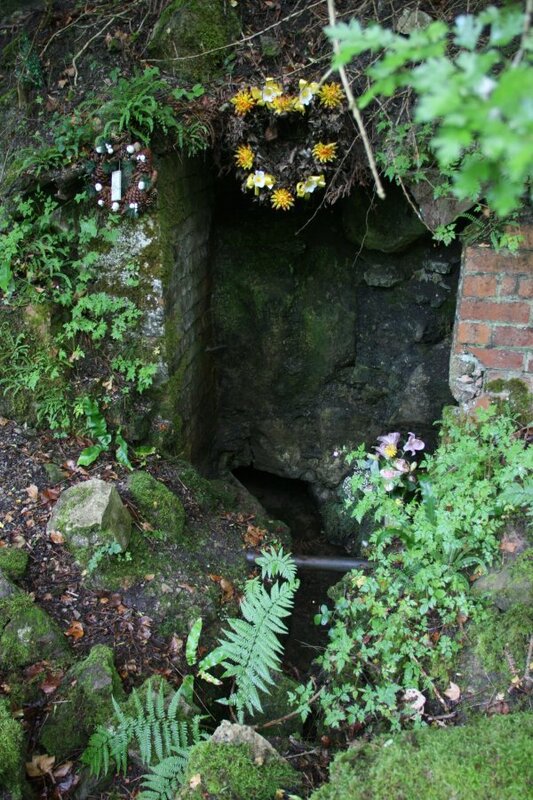 This is the resurgence for the stream that flows North through Gilwern Passage in Ogof Draenen, the longest cave in Wales, which sits beneath the Blorenge, Pwll Du and Gilwern Hill. Seems someone thinks it is a shrine; it really isn't. 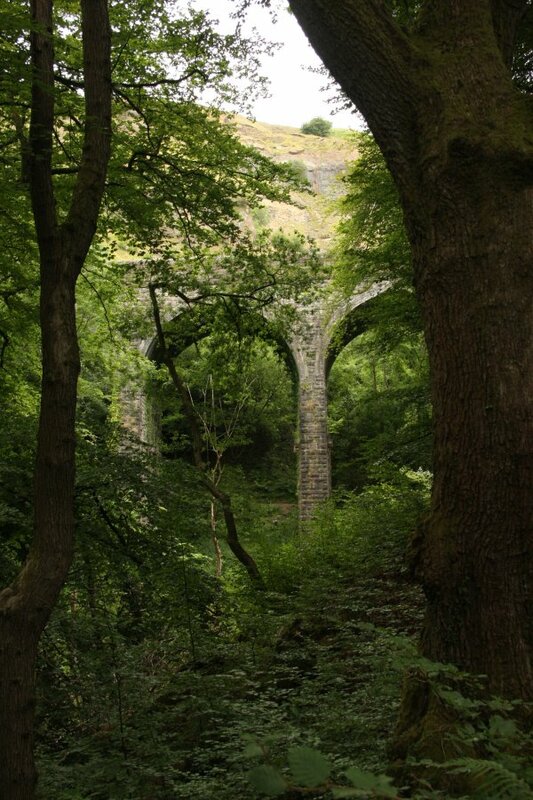 Industrial revolution era viaduct in Cwm Dyar. 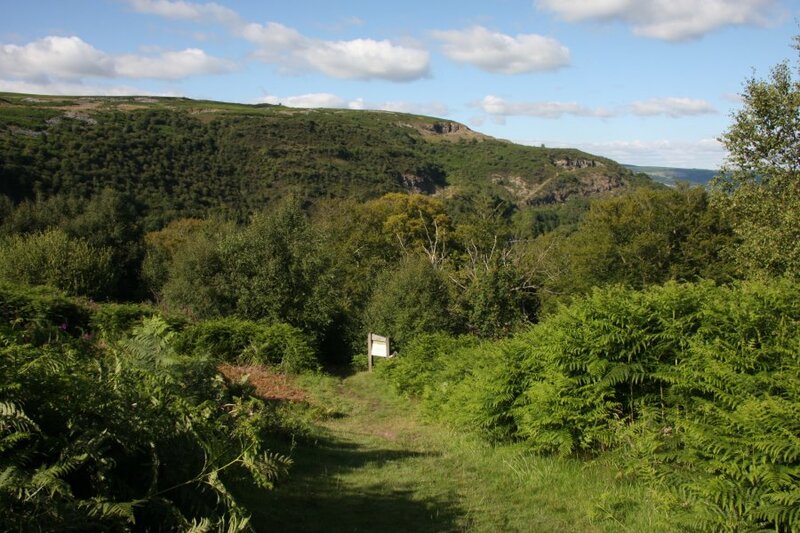 The valley in the distance is the Clydach Gorge, between Llanelly Hill and Mynydd Llangatwg. 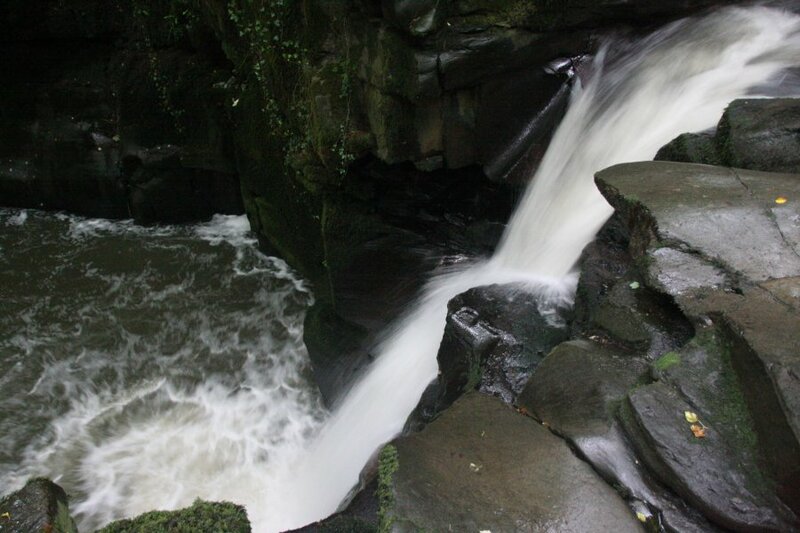 Some of the Cwm Dyar Waterfalls below the viaduct. 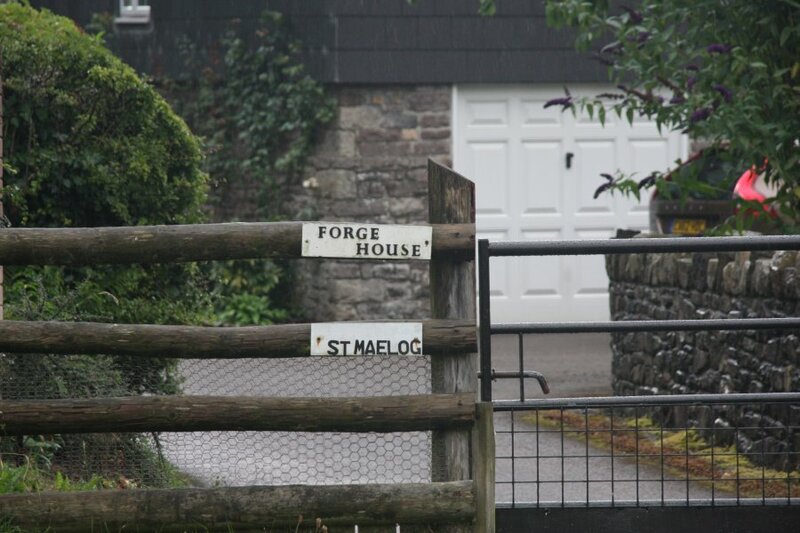 Forge House in Maesygwartha (at the tip of Gilwern Hill, close to Gilwern). Although it doesn't look like it, there is a footpath hidden in the driveway of this house, leading along the river. 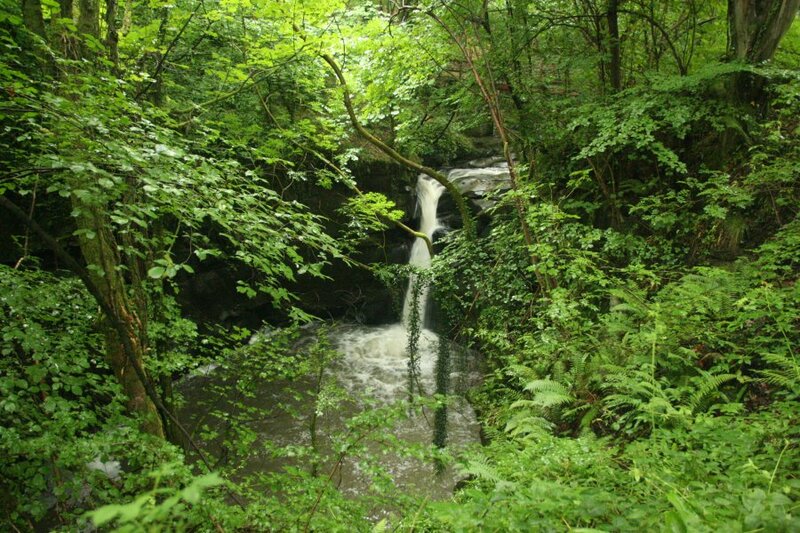 The river plunges down Pwll Rhys, one of the largest waterfalls in the area. Pwll Rhys, about 7-8 metres tall. Bridge at Danycoed over a smaller stream draining Waunllapria. 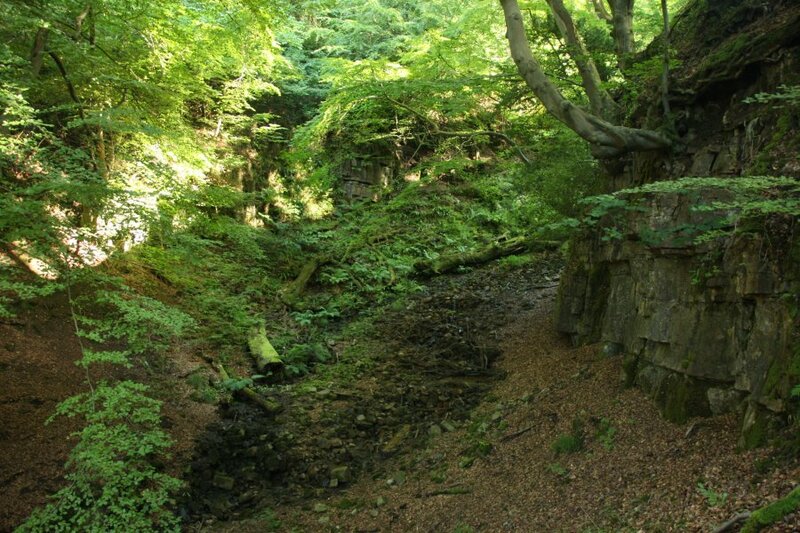 The stream usually runs dry, sinking into a cave originally found by yours truly many years ago. 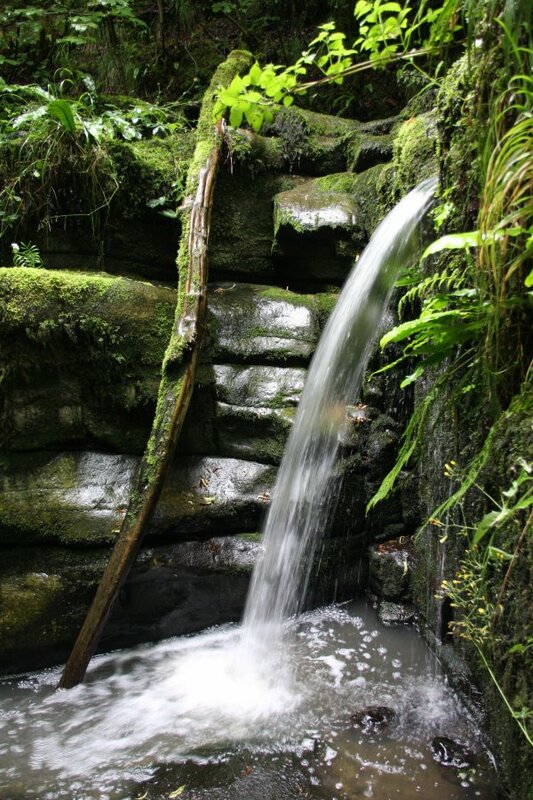 When it does carry water, there is a waterfall under the bridge. 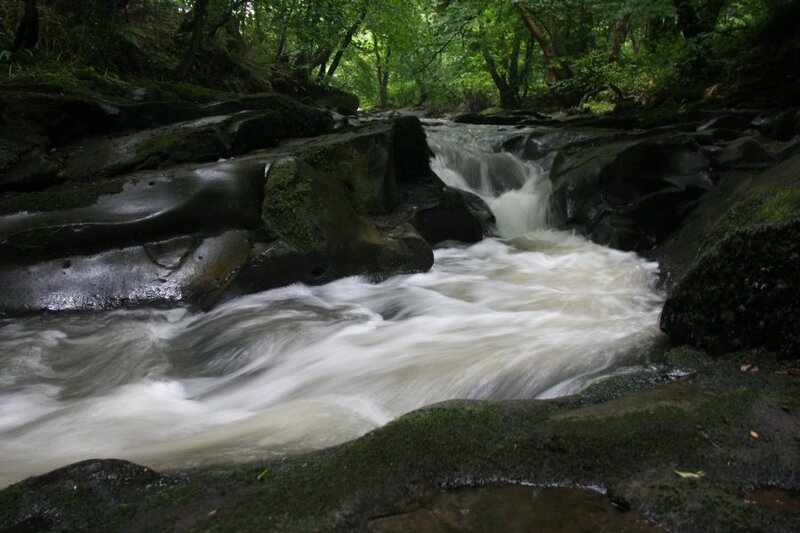 Powerful cascade at the lower end of the Clydach Gorge. 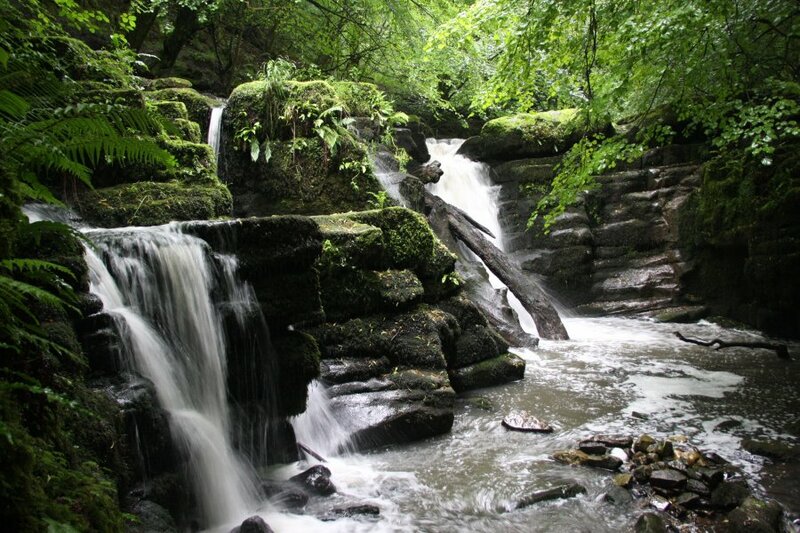 Pwll Crochan, a smaller waterfall but one of the most beautiful in the gorge. 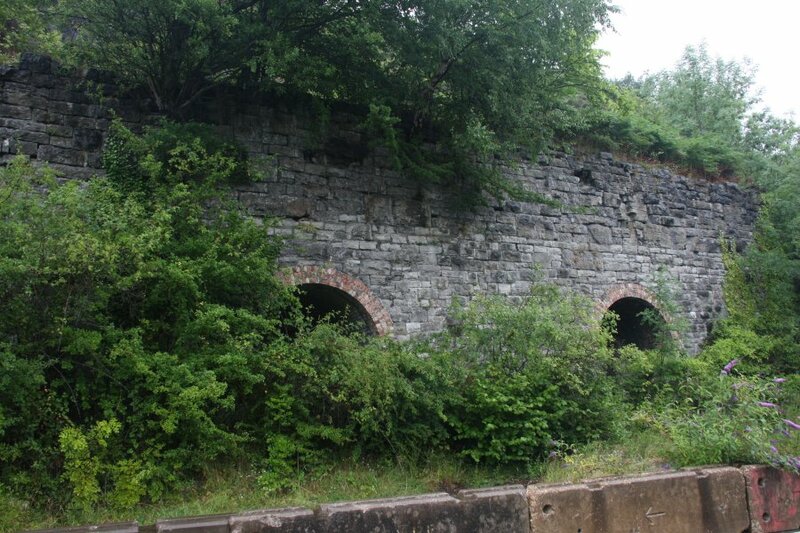 Limekilns between Clydach North and Blackrock. 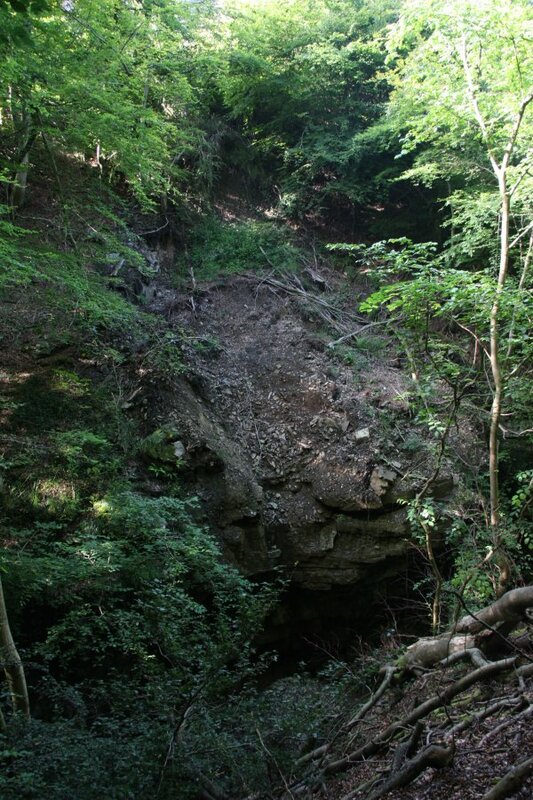 This is the location of Ogof Craig a Ffynnon, and some smaller caves like UB40 Dig. 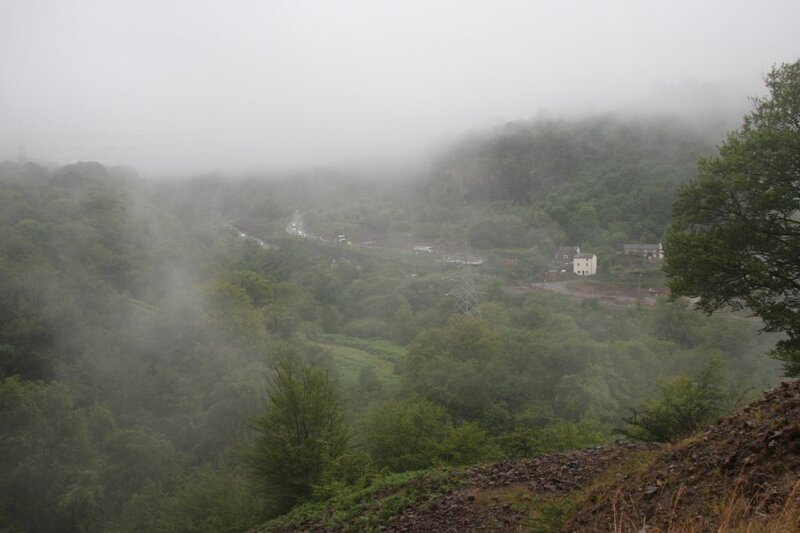 Rain over Cwm Pwca (Puck's Valley, the inspiration for Shakespere's A Midsummer Night's Dream. Roadworks moving the Blackrock road beside the Blackrock Quarry. The main valley road is being widened into a dual carriageway, which will dramatically change the access routes in the valley. 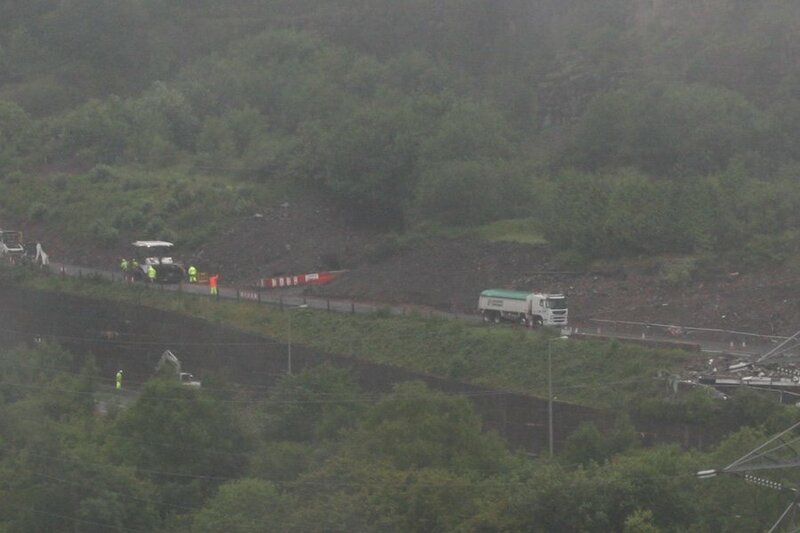 Hopefully Waterfall Cave (directly under these roadworks, starting in the quarry behind them) will survive it. 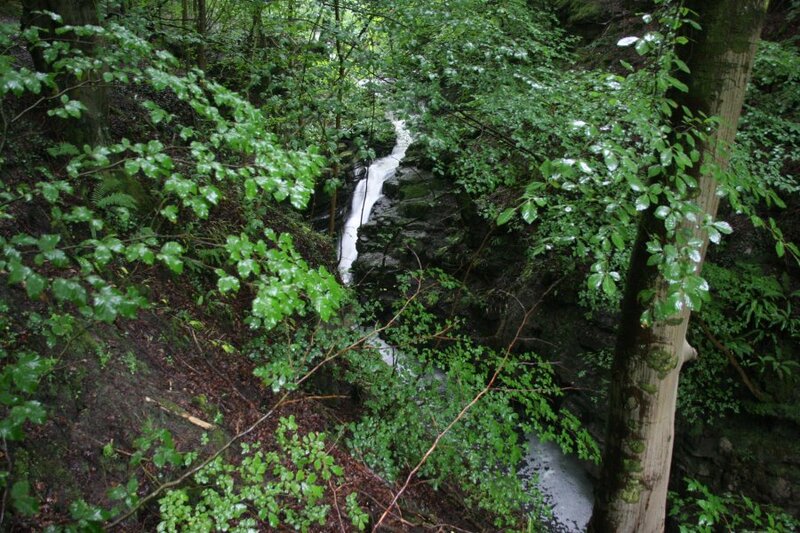 Artificial waterfall in a gully next to the dismantled railway line. 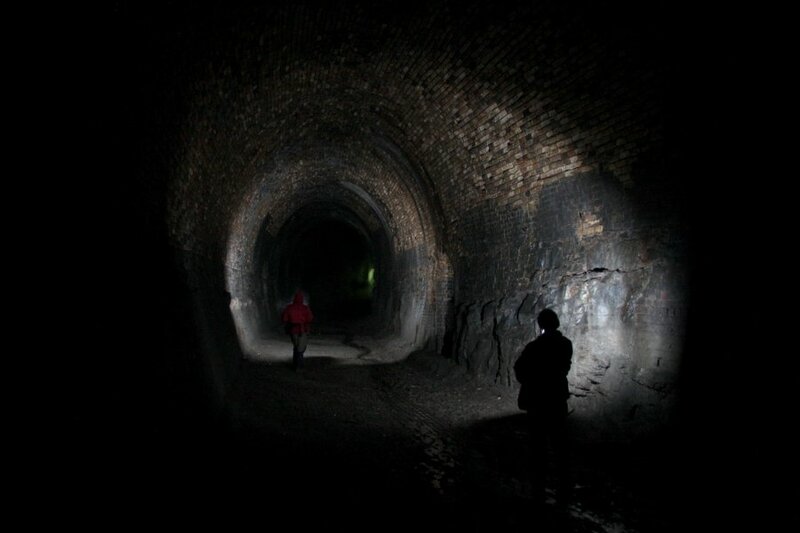 Archway passage leading to the other tunnel. This has collapsed rather badly over the years, and has recently been gated. 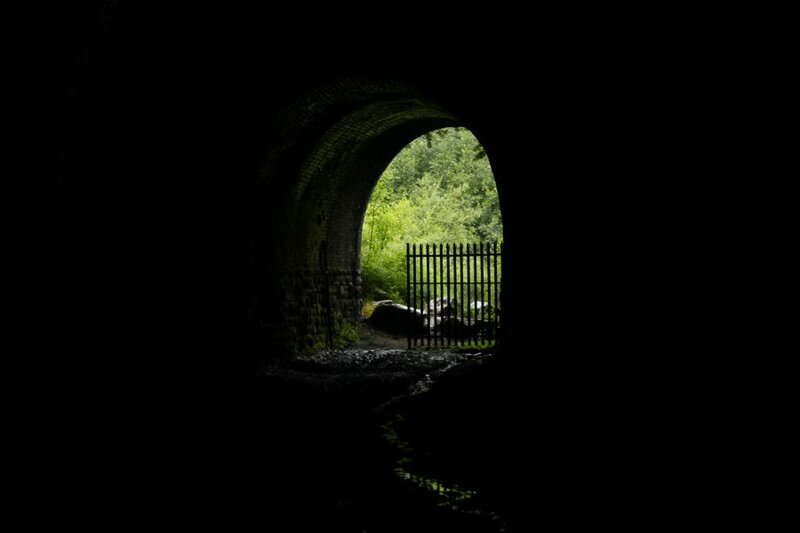 Gellifelen tunnel. This picture was taken without dedicated flashguns. The camera was handheld (with only minimal blurring of the distant light at the exit) with the shutter held open for 5 seconds on Brief. Two digital cameras were then used to provide the flashes with their built in flashguns. This was done just to demonstrate how cave photography might be done (using dedicated flashguns of course), but I really like the end result. 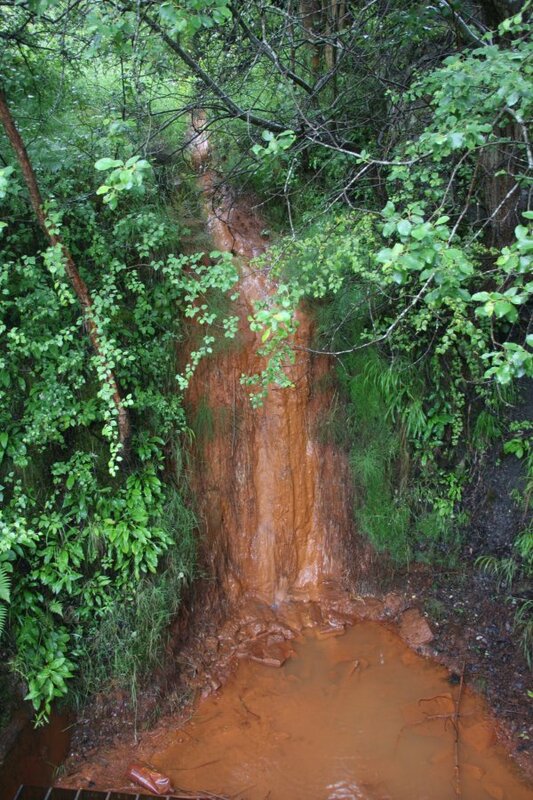 Rusty waterfall at the outflow from the Gellifelen adit. 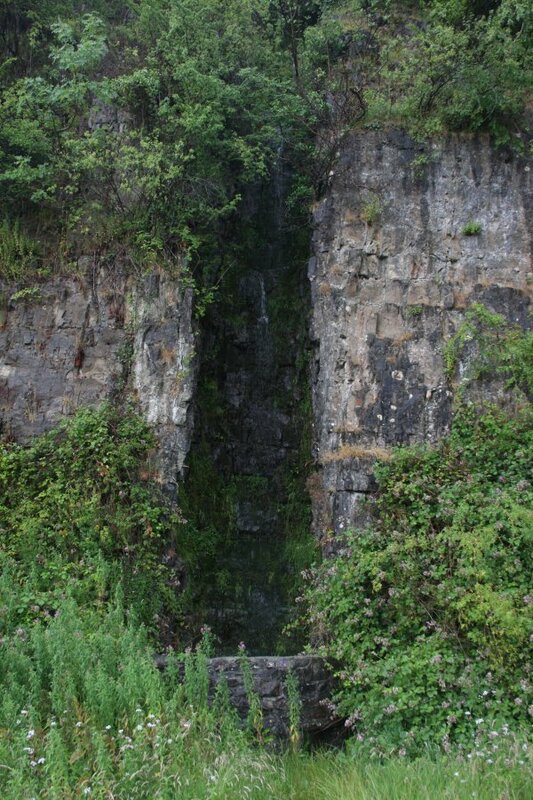 Devil's Waterfall, the tallest of the main river waterfalls in the Clydach Gorge, at 10 metres. Most safely viewed from the Devil's Bridge above it. 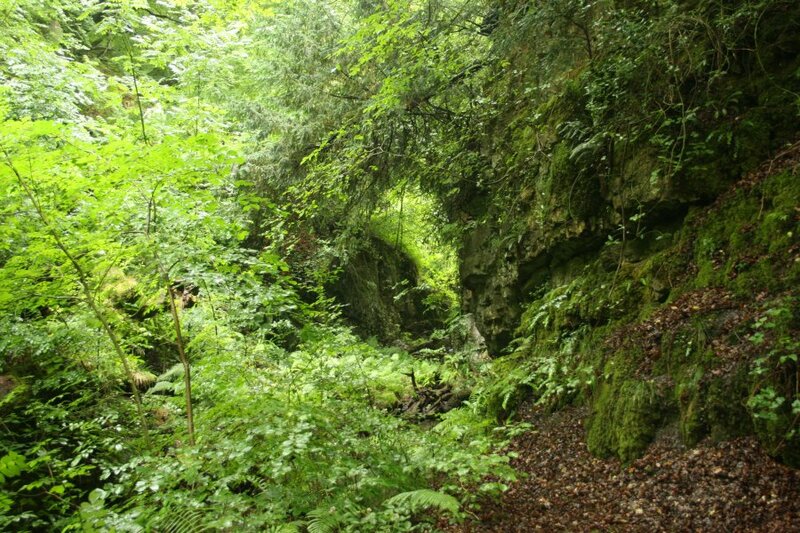 Elm Hole, the cave on the far bank. 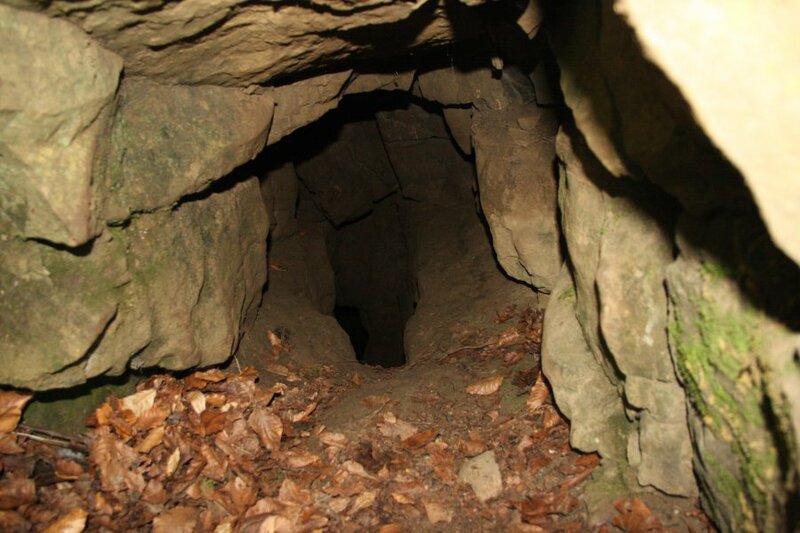 The cave is one of the resurgences of Ogof Daren Cilau, draining most of Mynydd Llangatwg. The clean water can be seen emerging next to the cloudy water of the river. 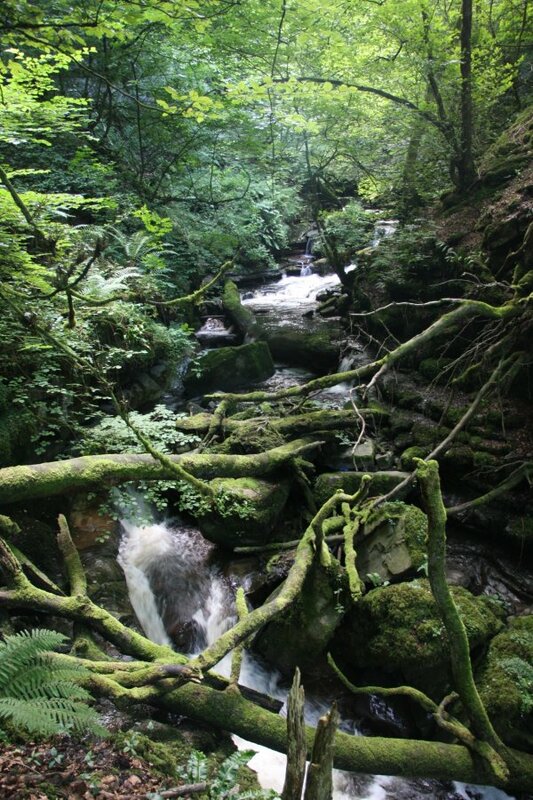 Overgrown gorge carrying the Gellifelen stream down into the Clydach Gorge. Path from Gellifelen down into the main gorge. 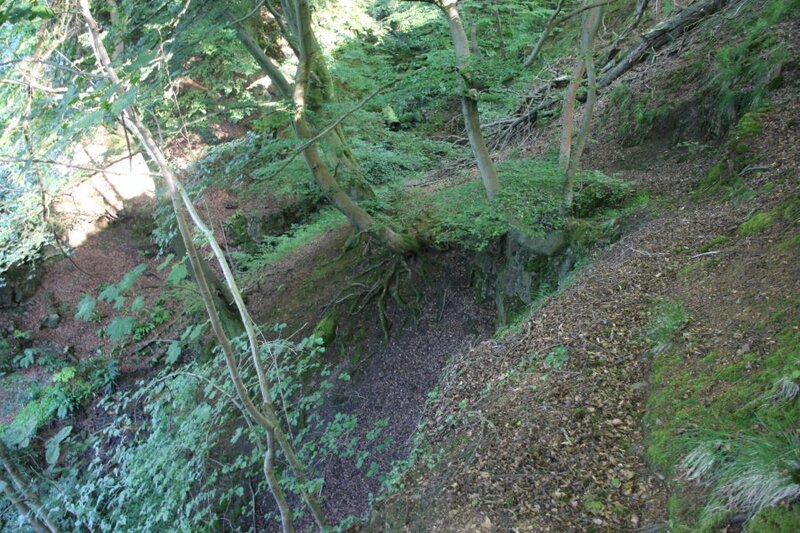 A side branch leads down this ledge, but has been signed as dangerous. 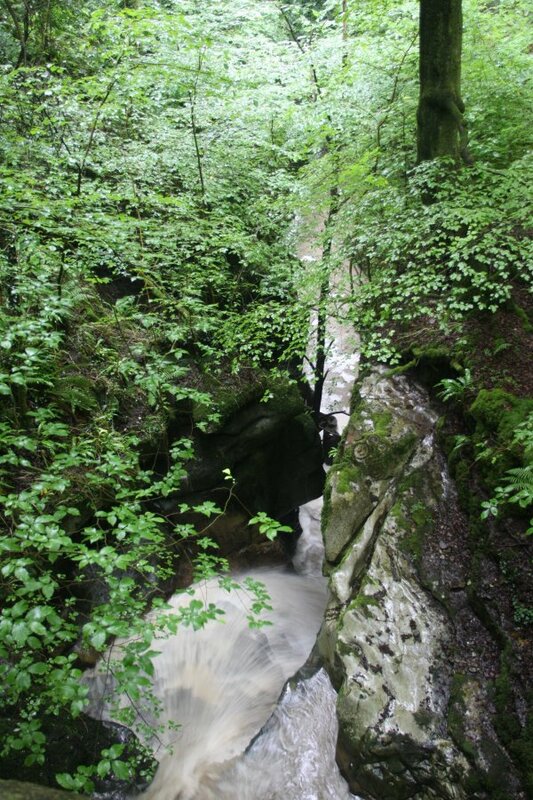 It leads into this little gorge where there is a path downstream to Devil's Bridge. 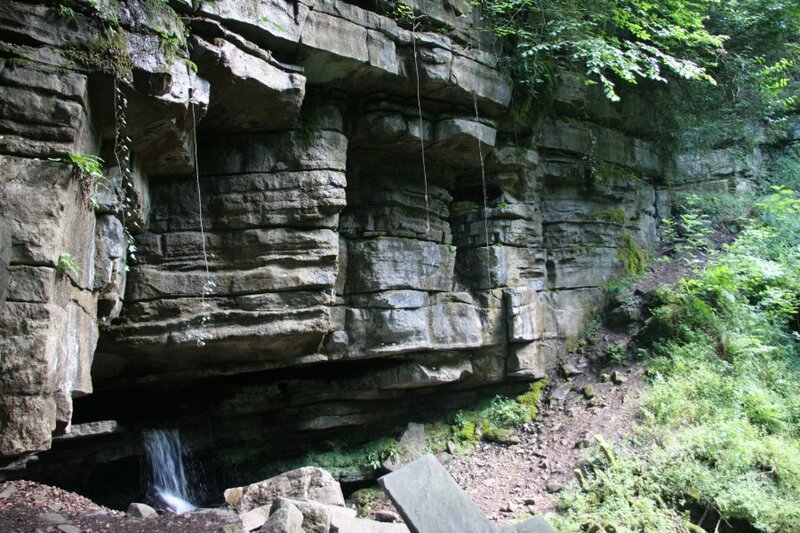 Shame that the sign says it is dangerous, because this could make a useful walking route linking up the waterfalls. Waterfall Cave Resurgence Waterfall on the far side of the gorge, as seen from the proper path (the one to Ogof Clogwyn, not the one marked as dangerous). 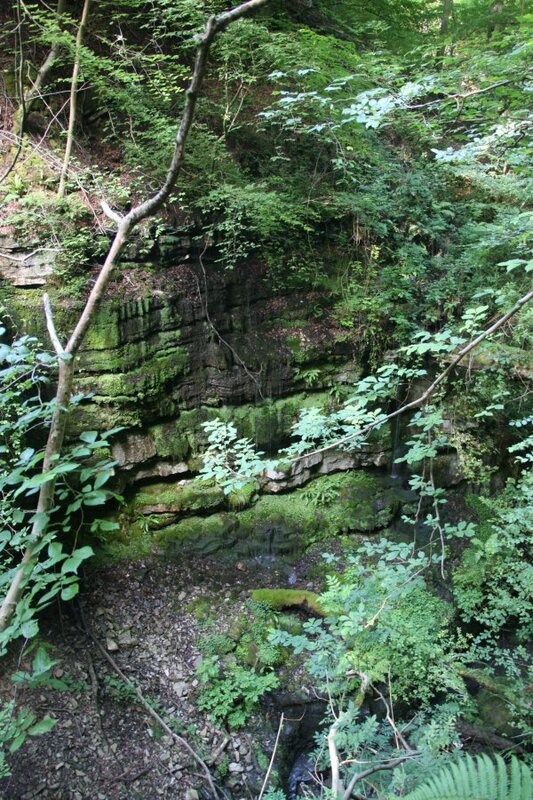 The resurgence from Waterfall Cave can be seen just above the waterfall. More dribble than fall today. Immediately upstream was a landslide. 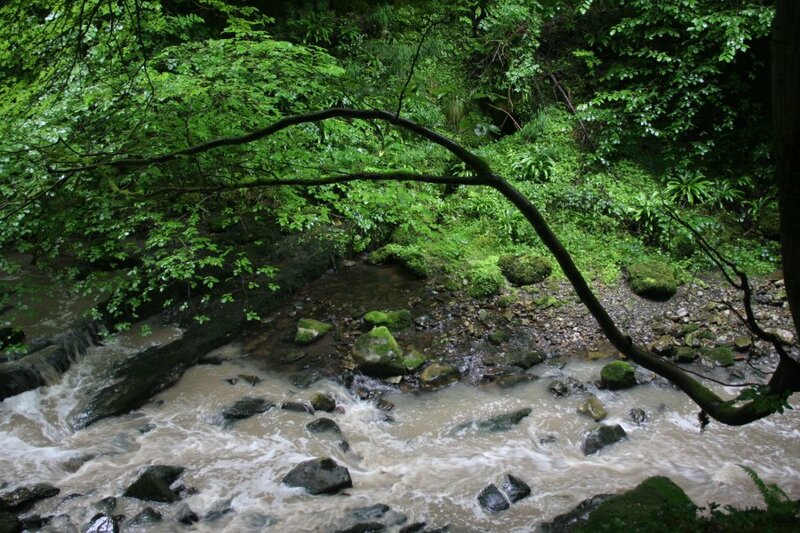 Several trees had slipped down into the gorge. 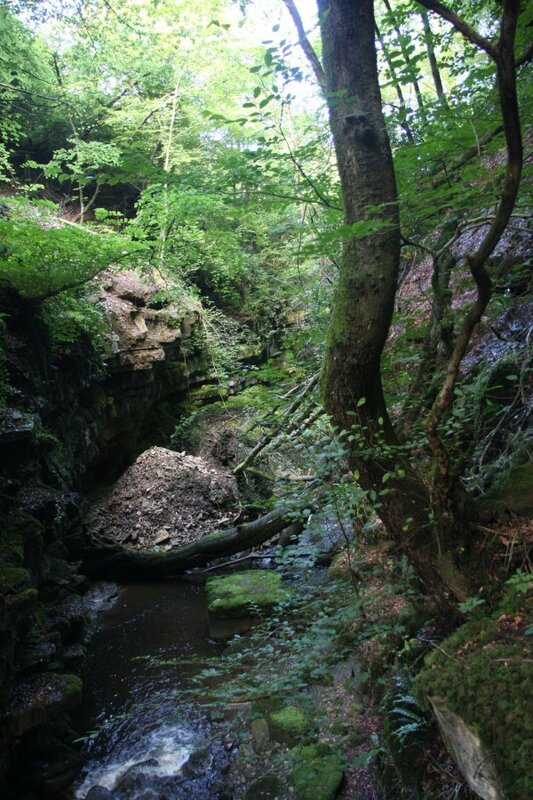 Ogof Clogwyn, with its little waterfall. Two narrow rifts in the rock beyond it are alternative entrances. 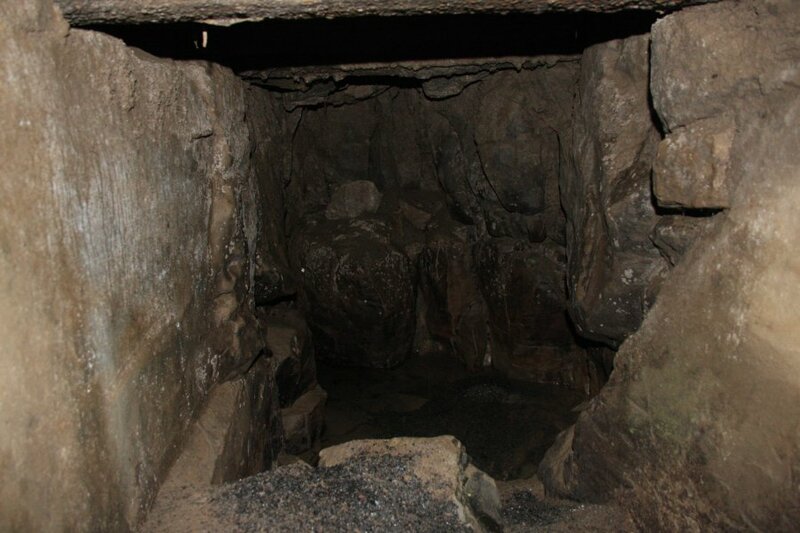 Hidden on the right side of the picture is the entrance to Pylon Cave. 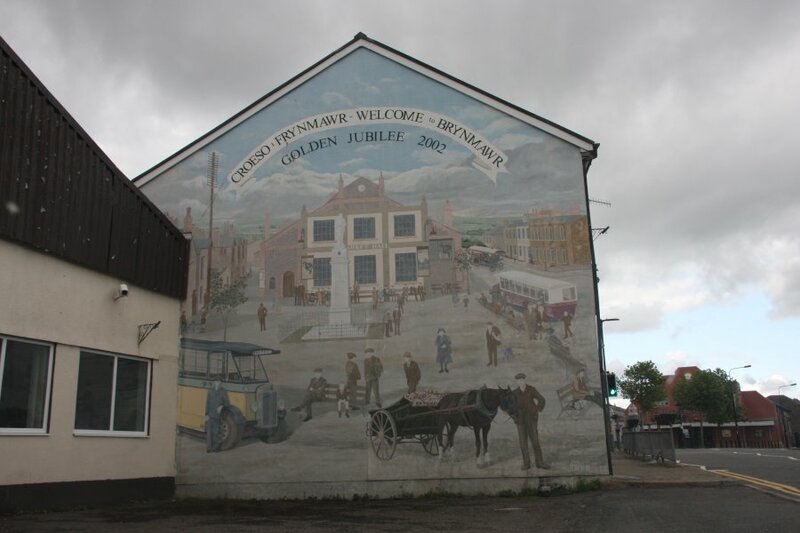 Incredible mural at Brynmawr, painted by one of my walking companions. 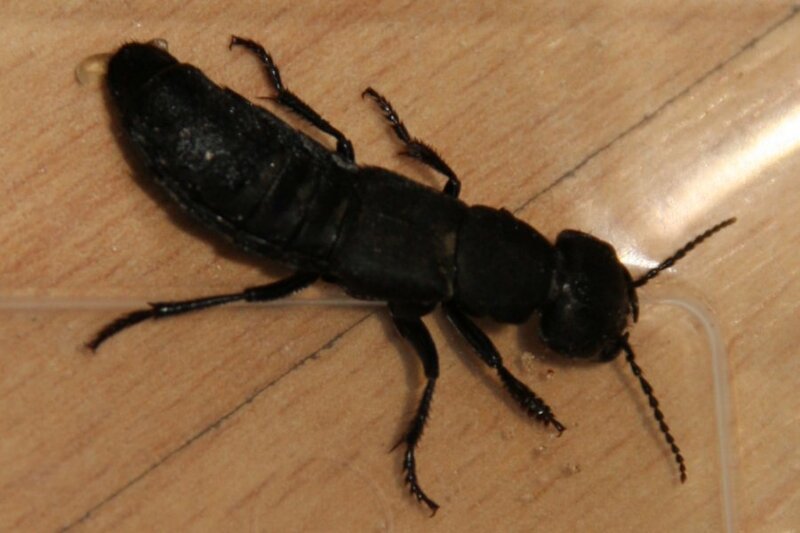 Devil's coach-horse beetle, a large beetle that holds its tail up like a scorpion, and squirts bad smelling liquid. It also opens its pincer-jaws as a threat. Actually in Cardiff, but let's pretend it was in the Southeast Beacons.